The US Fed Chairman Powell emphasized the central bank`s push to raise interest rates despite President Donald Trump`s recent criticism of higher interest rates. The topic of Fed Powell speech at the Jackson Hole Symposium was “Monetary Policy in Changing Economy”. US have gradually raised its interest rates from 0.25% at crisis level towards the new normal rate of 2.0% at present. Fed sees the current path of slowing raising rates to be the new normal policy as the unemployment rate has declined steadily, currently near 3.9% which is at a 20 year low while inflation has recently moved up near 2 percent suggests that there is no sign that the economy is overheating. According to the Fed, US economy faces three of the real long term structural challenges – slow growth in real wages, decline in economic mobility, meeting the budget deficit and a decade long low productivity path. 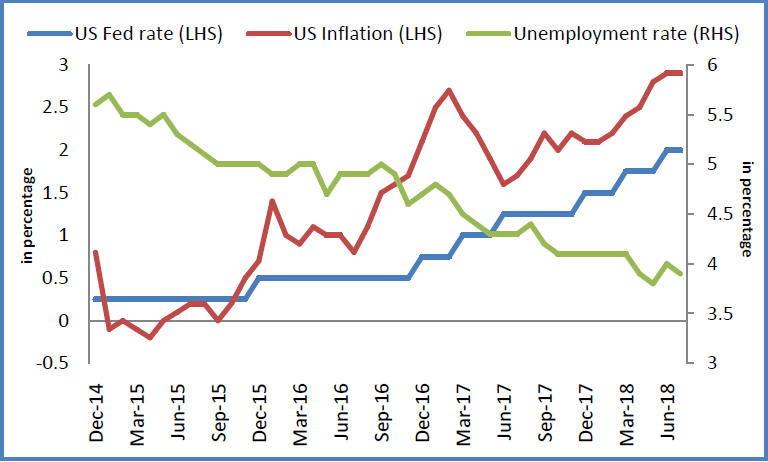 Fed reversed its monetary policy and increased rates seven times by 25 bps since December 2015 with no looking back on its course of action expressing confidence in the economy and further gives assurance that it can keep the inflation well under control. Fed said with strong economic outlook, inflation close to its targeted level and job market running satisfactorily well, my team of analyst are monitoring the economic data and setting up that the appropriate policy which could benefit the growth, strong labour market and keep inflation at appropriate levels. At the same time, Powell said that in case the economy faces any financial crisis or inflation rises beyond controllable level, "We will do whatever it takes." With the US economy on a verge of new normalization, US Fed doesn’t seem comfortable in viewing the changes in inflation as a single barometer to decide on future course of action over interest rate hikes as other economic areas are performing strong with solid household, business and consumer confidence, continuous increase in job creation, slow and steady rise in income and employment. Fed Powell’s measured tone about the economy and the message he gave appeared to have reached the investors quite clearly with the stock markets closing in green and Dollar index reversing its uptrend. Fed Powell is on track for at least several more increases in the Fed’s benchmark short-term interest rate which means September rate hike appears to be right on table. As of 2018, there have been two rate hikes and two more rate hikes are coming, one in next month and the other one in December.